It’s a Mother’s Day story with a twist…and a happy ending. A sow bear and her cub are resting comfortably after a concerted effort to capture both animals Sunday. The Florida Fish and Wildlife Conservation Commission (FWC) responded to reports of an injured bear with a cub in the Osceola National Forest. The bear had been caught up in the fire that raged through the forest last week. When the bear capture team arrived on scene on private timber land, off Sand Hill Road in northeastern Columbia County, the sow was at the base of a tall pine tree. The cub had climbed about 65 feet up the tree. Three FWC biologists and the FWC veterinarian assessed the situation and decided to sedate the sow and determine how badly she was injured. Dr. Mark Cunningham, FWC veterinarian, and Jim Garrison, lead biologist at Camp Blanding Wildlife Management Area, approached the sow. She watched them intently but didn’t move. The first dart hit a tree. On the second try, Cunningham tranquilized the sow, and after 15 minutes, the bear laid her head on the ground, asleep. The bear was loaded onto a stretcher and brought to the road, where Cunningham performed a preliminary examination and inserted an IV into the bear’s hind leg. The cub, however, presented a different problem. “Mom probably ‘woofed’ her up that tree, and she was not going to come down anytime soon,” Cunningham said. The plan was to bring the sow back under the tree and see if the cub would come down to join her. The mother bear was brought back into the woods with her IV bag hanging from a burnt limb. After another 20 minutes, the cub still hadn’t moved. Cunningham decided to take the sow to the University of Florida veterinary school. Officers helped him load her into the back of his truck. To get the cub out of the tree, officers and biologists came up with an assortment of ideas. “We have to come up with ‘Plan B,’” Garrison said. The new plan involved clearing the area around the cub’s tree and moving in a bucket truck that could reach the cub. The FWC made calls, and heavy equipment rolled into the area. A road was dug to the tree and the area around the cub’s pine was cleared. During the clearing operation, the cub climbed even higher into the tree. “She picked the tallest tree in this section of forest,” Garrison said. Columbia County Public Works brought in a bucket truck. After a quick lesson on how to operate the controls, Garrison went up after the cub. He was three feet short of being able to reach the animal. “I have a jab stick. If I could get close enough, I could sedate her. However, I just can’t reach her,” Garrison said. The dart gun was the next option. The first three darts bounced off the cub’s hindquarters. The new dart injected enough drugs into the cub to put her to sleep. She slid down the tree and landed in a tarp FWC officers were holding around the base of the tree. Elina Garrison, research biologist at the FWC’s Gainesville lab, estimated the cub’s age at about 3 ½ months and determined that the cub was a female. The cub was loaded into a wooden box and placed in the biologists’ truck for transport to the veterinary school. “There are a number of people to thank for assistance in this rescue,” said Maj. Bruce Hamlin, regional law enforcement commander for the North Central Region. 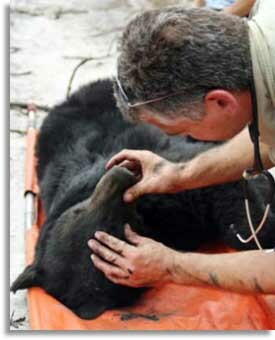 “In addition to all the FWC officers who were on scene all day with the bears, we had help from a variety of agencies. “I’d like to thank Mike Minton and Randy Sherrouse from the Columbia County Fire Department; Paul McCeithon and Wayne Ragans, Columbia County Public Works, who ran the bucket truck; Pat Raulerson from The Forestry Company; and Jack Kennedy and David Lyles, from MA Rigony in Perry, who cleared the area in their skidders,” Hamlin said. After the bears are rehabilitated at UF, they will be released. Officials are in the process of determining where the release will occur.